Canned vs. Dry Food- Which is better for cats? Home » Canned vs. Dry Food- Which is better for cats? Last week’s blog on my thoughts about preventive veterinary care for dogs and cats sparked a lot questions this week particularly from my cat owners. I love seeing owners getting involved in preventive veterinary health care for their pets, and hopefully we will see more cats in for those yearly physical exams. I think with all the recent “scares” with certain pet foods (see “In Vet News” for food recalls), a lot of the questions were about what they should feed their cats. I read a great veterinary article recently on this very question. Here are my recommendations based on my experience and the information in the article. If we think of our “wild” cats, they are meat eaters or carnivores. So are our domesticated cats. They need protein from meats in order to obtain essential nutrients. So based on this, we like to see our cats eating canned food because they are high in protein. A high protein, low carbohydrate diet helps prevent obesity and since obesity can predispose cats to Diabetes Mellitus, we are also lessening the chance of diabetes. The best time to consider nutrition is at the kitten stage. Feeding a combination of wet food and kibble is OK, but some cats really do get addicted to kibble. It gives them a sugar high. So what is a low carb diet? Typically low carb means less than 10% carbohydrate. If your cat is a little overweight, it is important to feed a low carb, high protein diet sooner than later (get ready Amber). That’s why the diabetic diets are formulated that way and why it’s recommended to feed canned food to a diabetic cat. 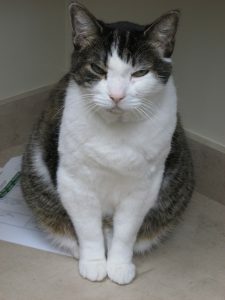 Our clinic cat Amber is getting a little overweight and needs to eat canned food. And if you have an older cat you can get them to switch over to a canned diet by slowly transitioning them onto the new diet – this can take up to 1 month. Recommendations are to mix 25% of the new diet with 75% of the old for 1 week, then go 50:50 for 1 week, then 75% new and 25% old for 1 week, and then onto the new diet by week 4. This is another reason to stress preventive health care, as discussed in last week’s blog. The earlier we can catch something the quicker we can try and turn things around. Talk to your veterinarian about any concerns you may have. Consider examinations on senior pets twice yearly and get the blood work done – that’s the only way we can get a picture of true internal health. Really consider feeding your cats canned food.